Kim's Slate sock is looking comfy already! The gusset is made with simple yarnover increases. Don't forget to knit the yarnovers through the back loop as with the toe. You're increasing the number of stitches around your sock in preparation to start the heel. Sylvia is just starting to turn the heel on her Chiva sock. Once you've finished the gusset you are ready to turn the heel. Turning the heel means creating the small half-circle of stitches that makes the bottom of the sock extend to cover the heel and meet the heel flap. You turn the heel by using short rows. The Purl Bee offers a great tutorial here that takes the mystery out of this shaping technique, or check out the video at New Stitch a Day, and just wrap and turn! If this is your first time using short rows, you'll be excited to learn that you need not be intimidated, and as you use them you'll find that mastering them opens up a world of new pattern options! Turning the heel creates the little wedge of stitches that is just under the heel flap, seen here on Charlie's Petunia sock. One of the things that may seem strange if you haven't done this before is that you aren't knitting all the way across Needle 2 and Needle 3. Some stitches are left unknit on each side. As you follow the pattern, those stitches will be picked up. Also, during the process of turning the heel and knitting the heel flap, you are working only on Needle 2 and Needle 3. The stitches on Needle 1 will just wait until you are finished with the heel. Up next - the leg, the cable, and the cuff. Rebecca's already finished one of her Coco socks! No matter what stage you're in, come join the conversation on Ravelry - we've been talking about color choices, calf increases, needle sizes, and more. As you can see from the pictures, we are all in different places in the project so come join us! We have started our Little Cable Knee High knitalong, and we hope you've chosen to join us! If you haven't cast on yet, don't worry. We are all at different knitting levels and speeds so we'll be continuing the discussion for a while over in the Anzula group on Ravelry. Sylvia's Chiva sock is off to a great start! The Purl Bee's pattern is written for double pointed needles. Most of us here use circular needles, so a few stitch markers are helpful for following the pattern to mark where Needle 1, Needle 2, and Needle 3 start. Becca chose to start her sock like she starts hexipuffs! This sock pattern starts with a provisional cast on. On this count, we were divided. Some chose to do this, starting with a crochet chain as explained here on the Purl Bee, or shown in a video here at New Stitch a Day. This method from Knitty was also used. Some chose to do Judy's Magic cast on instead of a provisional. Meg used the provisional cast on technique from Knitty to start her sock. One of the most important things to do before you get too far into the sock is to make sure that your gauge is correct. If you aren't sure, you can measure your gauge to make sure that it is the recommended 8 1/2 stitches per inch. Here's a little guide to measuring gauge from the Purl Bee. Rather than make a swatch for these socks, we all jumped in and started knitting the pattern. More than one of us had to frog and restart to get the proper gauge. Gauge will vary a little when knitting in the round rather than knitting flat, so make sure that if you decide to swatch, to do so in the round. Or just try the socks on. As you knit, the socks feel so luscious that it's hard to resist trying them on, anyway. Charlie made several modifications to her sock by trying it on frequently and adjusting as she went, so it is a perfect fit! Charlie used the provisional cast on for her Petunia sock. Have any other questions about knitting these socks, or any observations or tricks? Come join our thread on the Ravelry group. When the members of Team Anzula started considering a knitalong, we talked about more than a few different patterns. However, when we passed around the idea of doing these socks, the decision was unanimous. The Purl Bee released the pattern for the Little Cable Knee High socks in November of 2012. These socks are made from Squishy, in Seaside. We love the knee-high length, the classic cable detail, and the cute turn-down cuff. Before starting the socks, we each chose two skeins in Squishy and Dreamy, but you could also choose two skeins of Sebastian. Kim is knitting in Slate, Sabrina picked Watermelon, Diane is currently obsessed with Fiona, Becca liked Coco, Sylvia chose Chiva, and Meg is going to wear 1 Red Shoe. 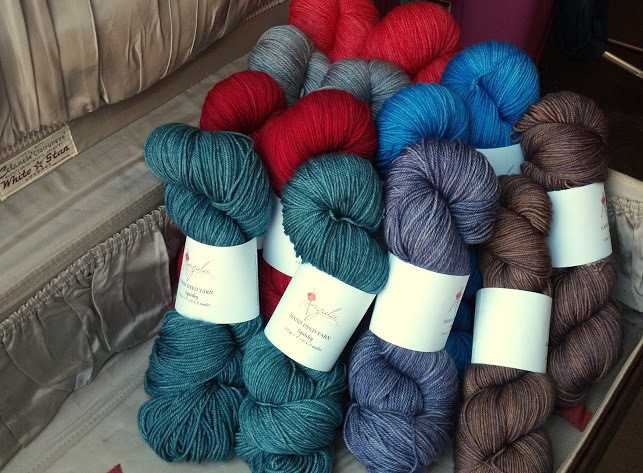 Not long after this photo of our yarn choices was taken, Charlie revealed her penchant for Petunia. Kim slipped off to the dye room to create a couple of Dreamy skeins especially for her, replacing her original choice of Teal that you can see in the photo. Besides your skeins of yarn, you will need the correct circular or double-pointed needles to achieve gauge (the pattern calls for size #2), scrap yarn and a crochet hook for the provisional cast on, and a cable stitch holder. You'll also need to visit the Purl Bee for the free pattern. We are all at different levels of knitting prowess so we hope that beginners as well as experienced knitters choose to knitalong with us. For beginners, we'll be posting helpful links at every step of the way. For experienced knitters, we hope that you'll share your own links and tips, and just enjoy having company as you knit a beautiful pair of socks. You can see our updates on the blog and our Facebook page, and participate in the Anzula group on Ravelry.